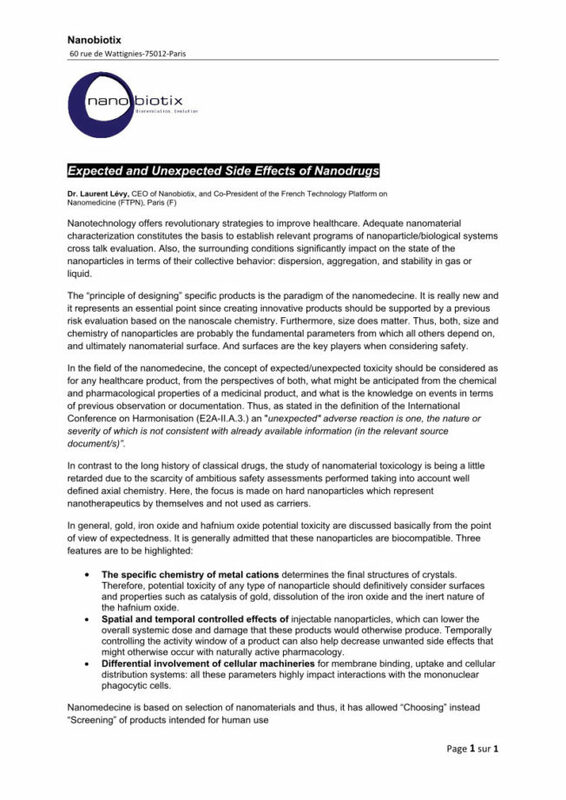 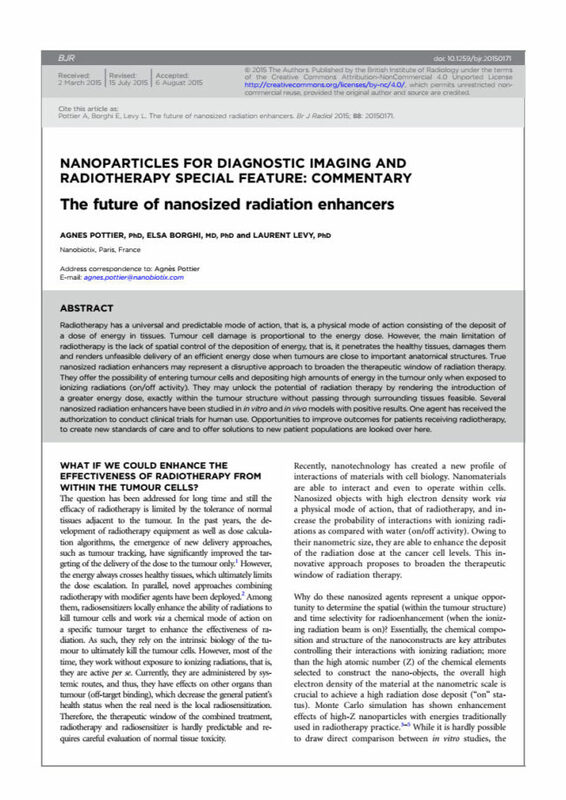 Nanobiotix has been a pioneer in the field of nanomedicine for more than a decade. 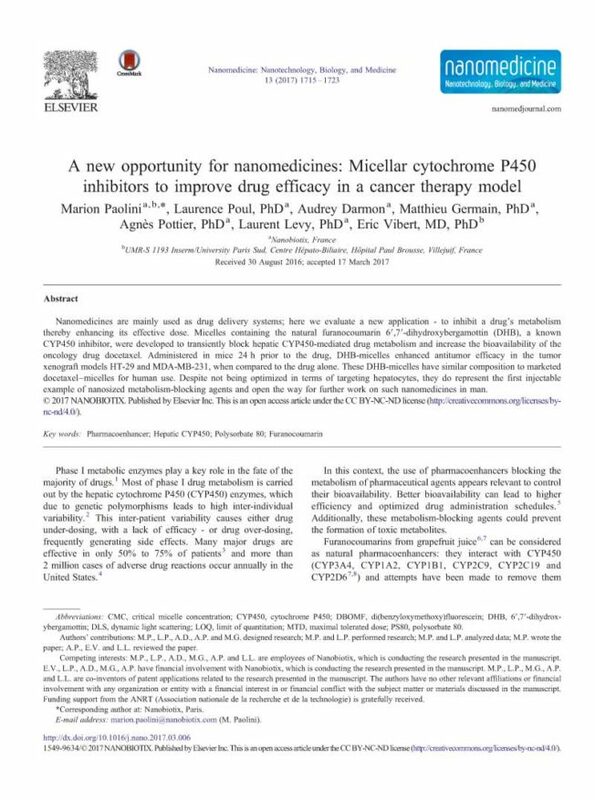 The idea is to follow a different path than other Pharma or Biotech companies by treating patients with nanophysical methods at the heart of the cell. 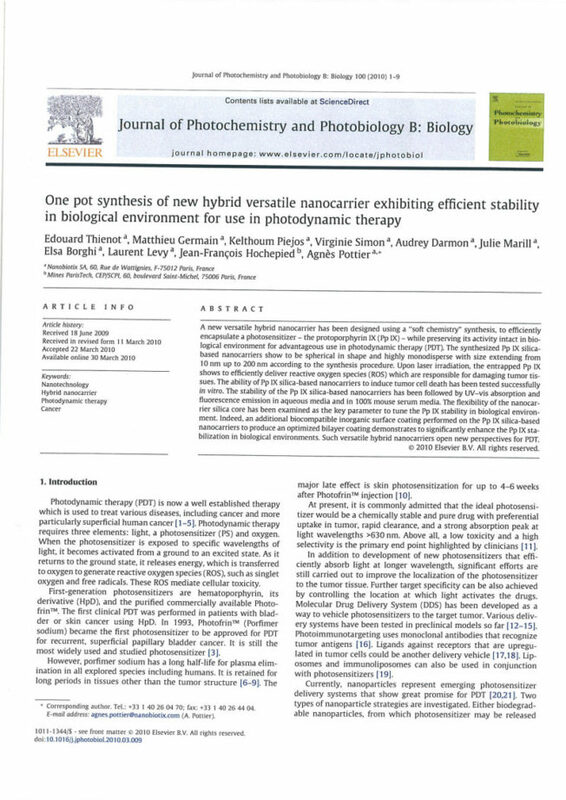 Over the years numerous publications and abstracts have been published which most of them are combined in this online bibliography of Nanobiotix. 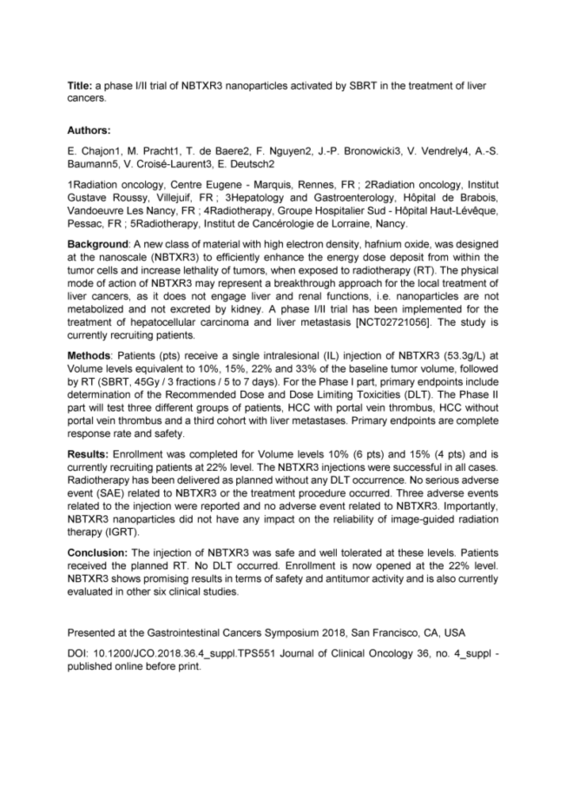 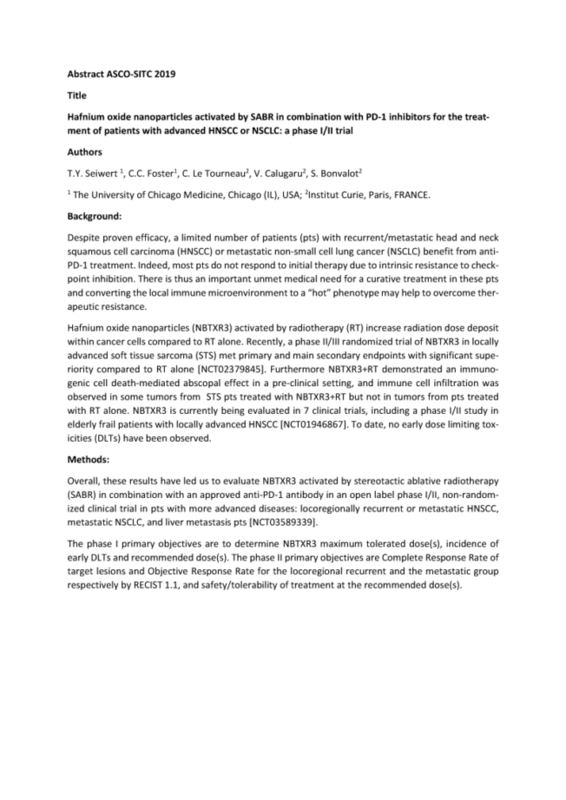 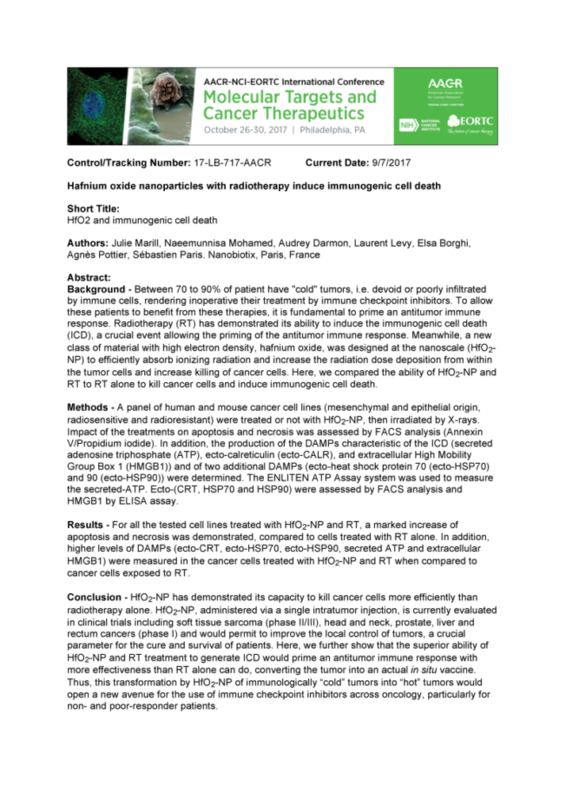 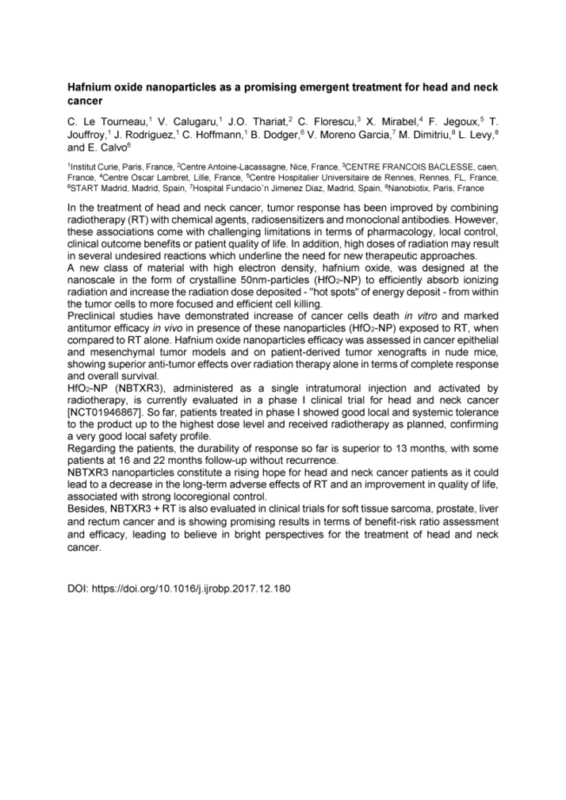 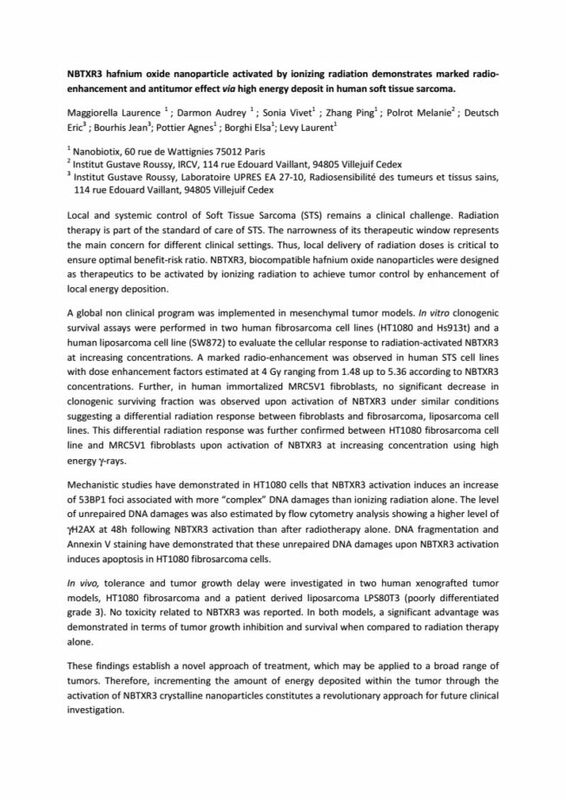 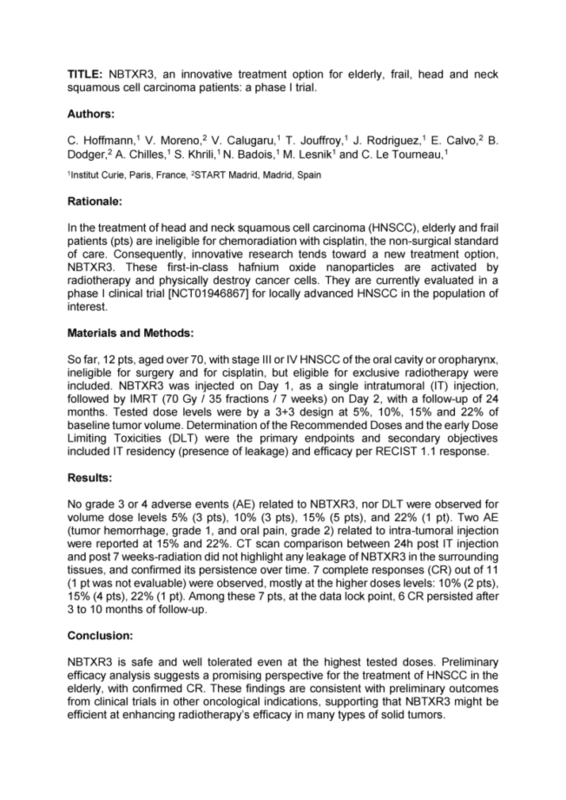 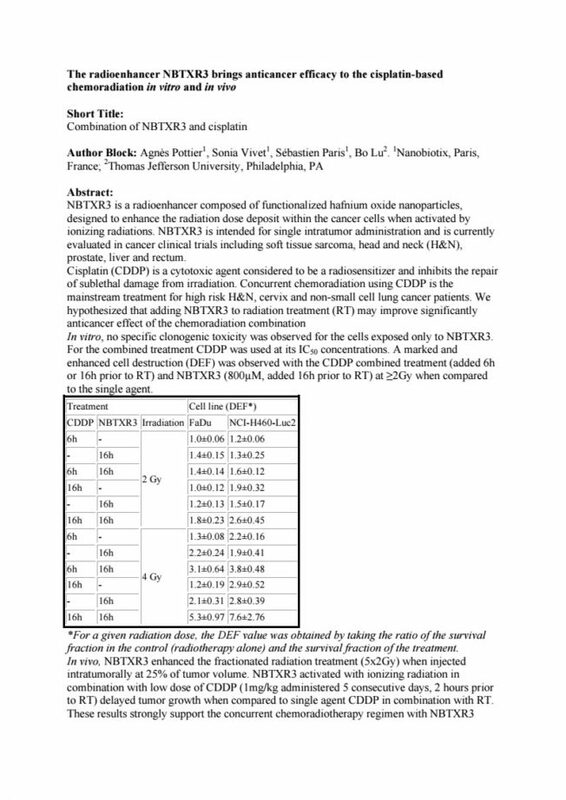 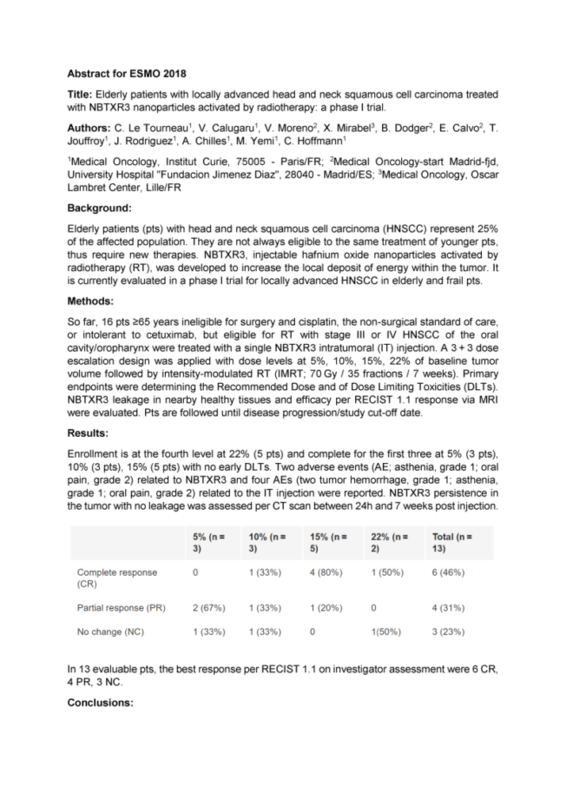 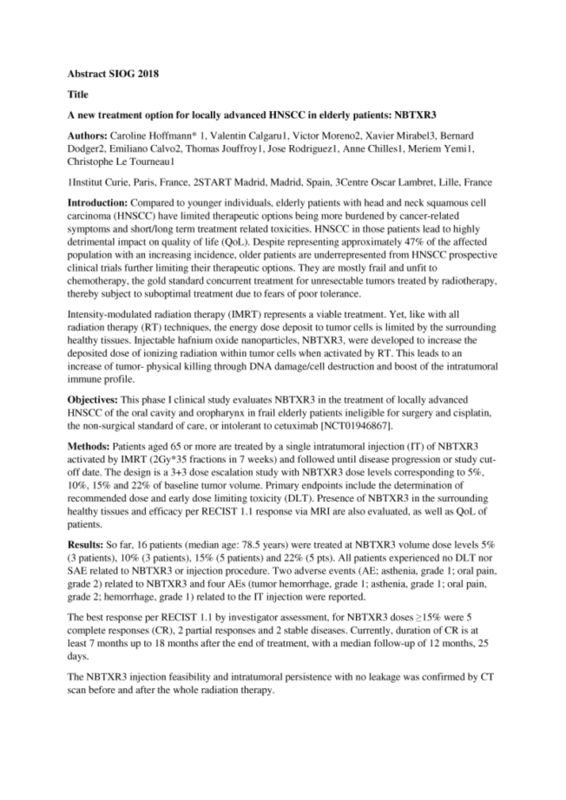 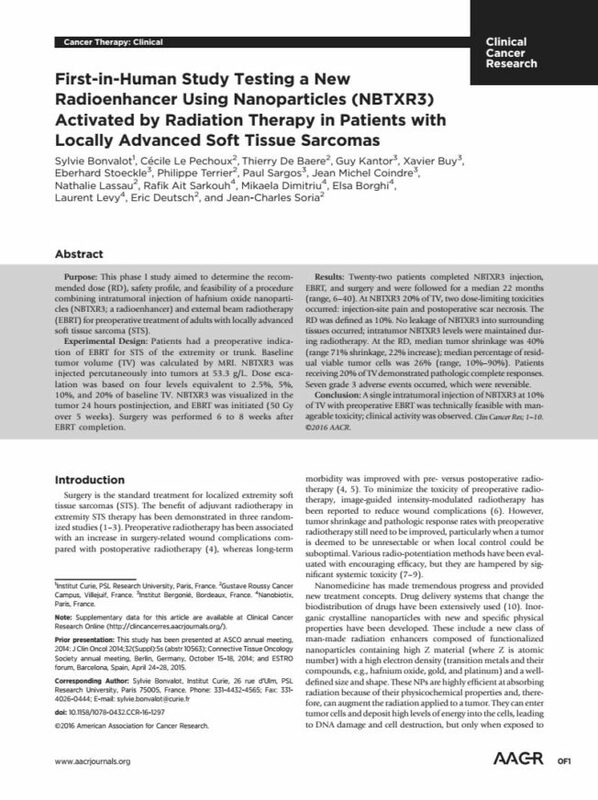 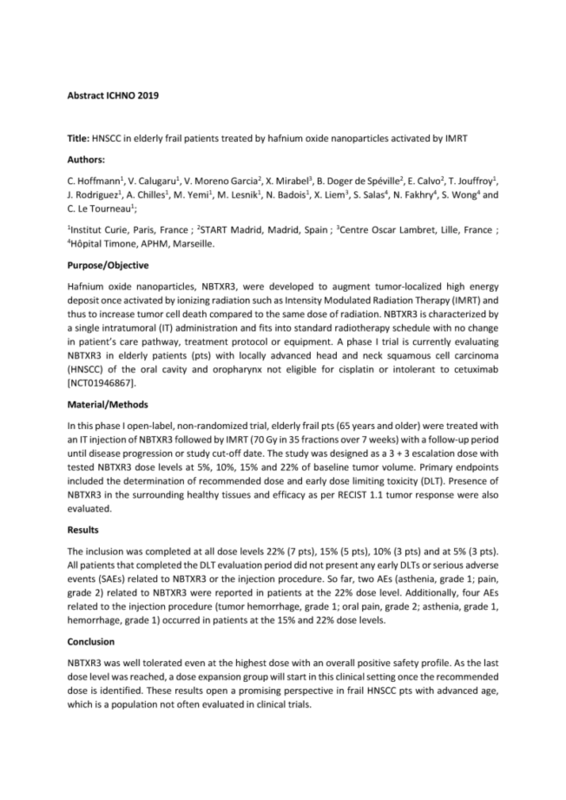 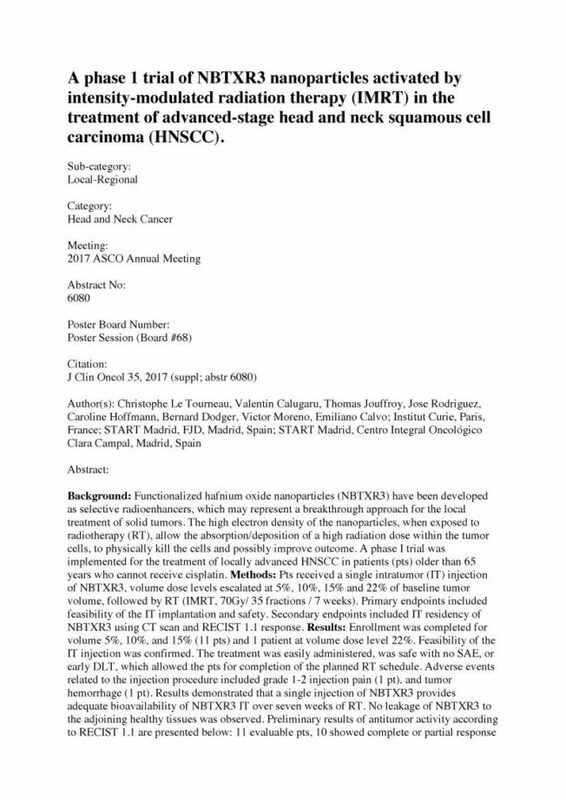 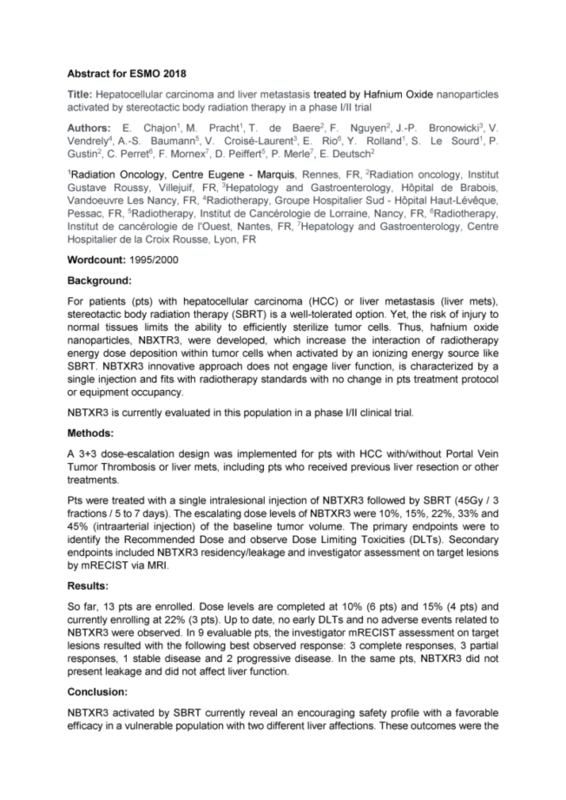 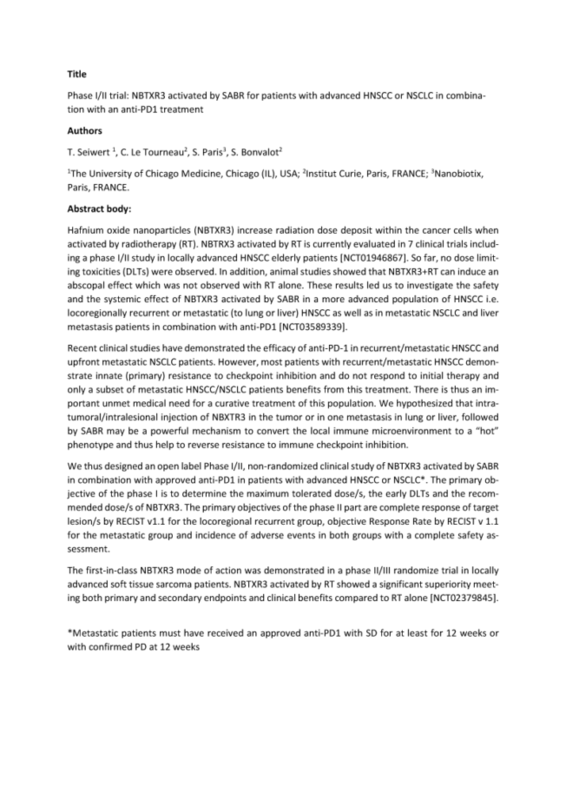 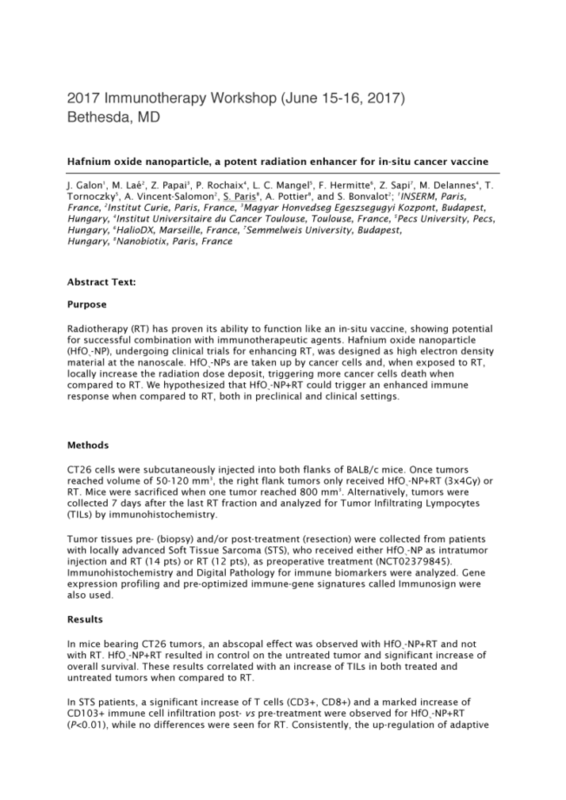 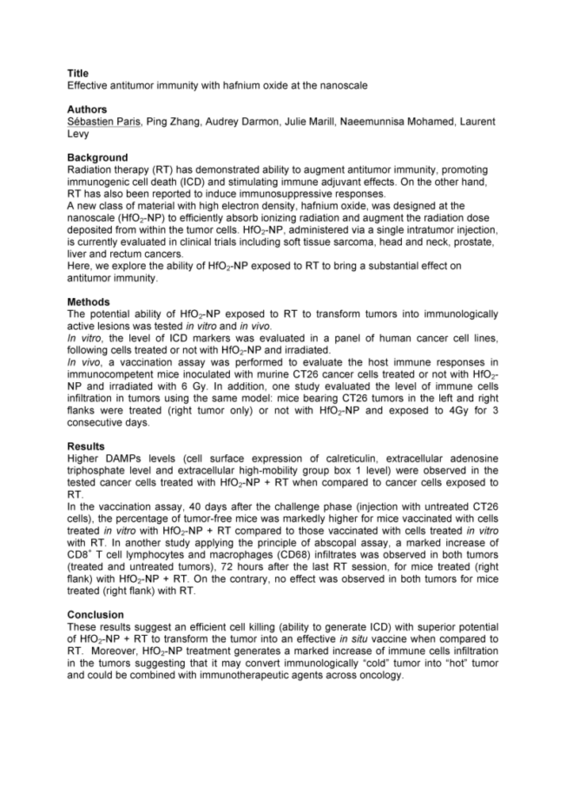 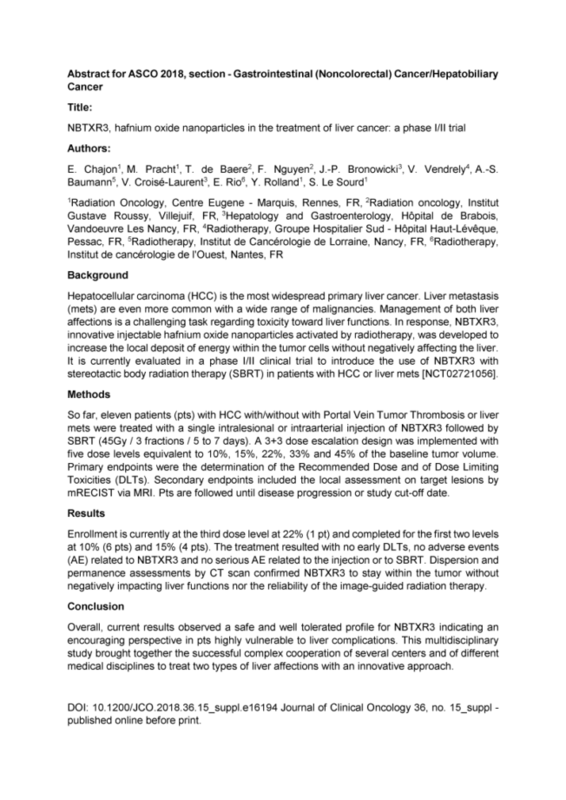 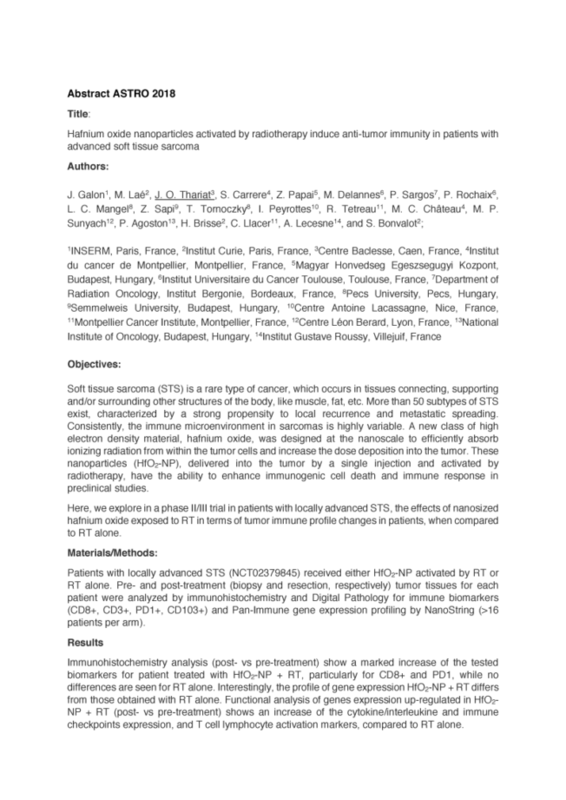 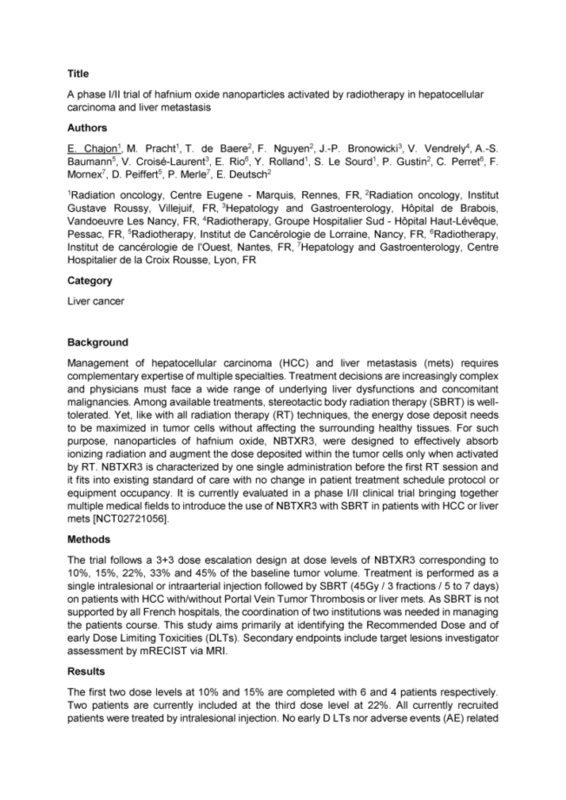 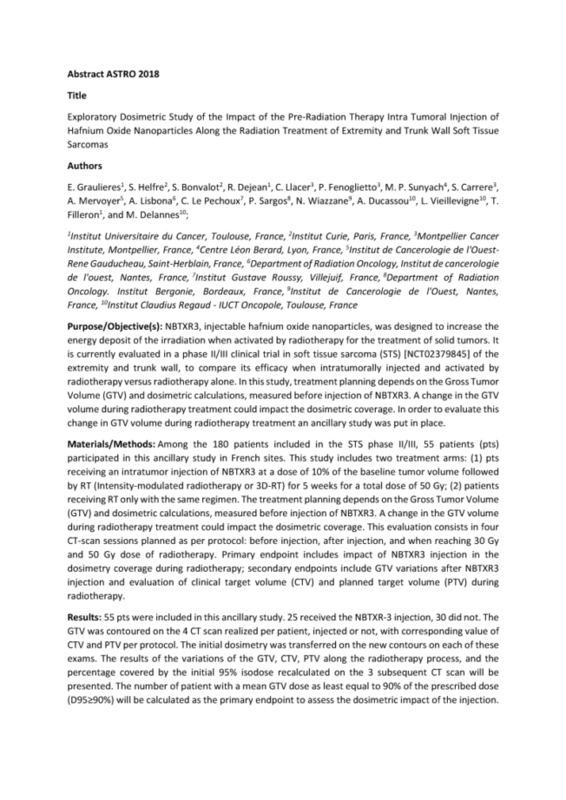 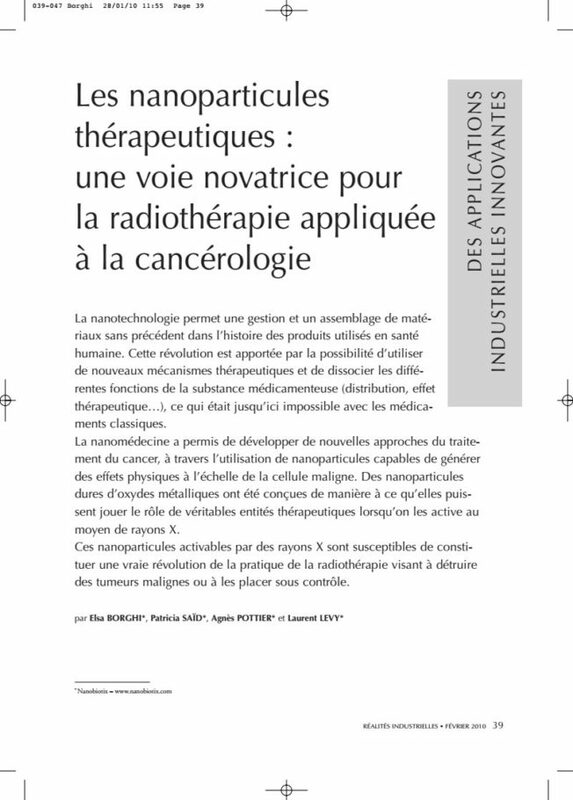 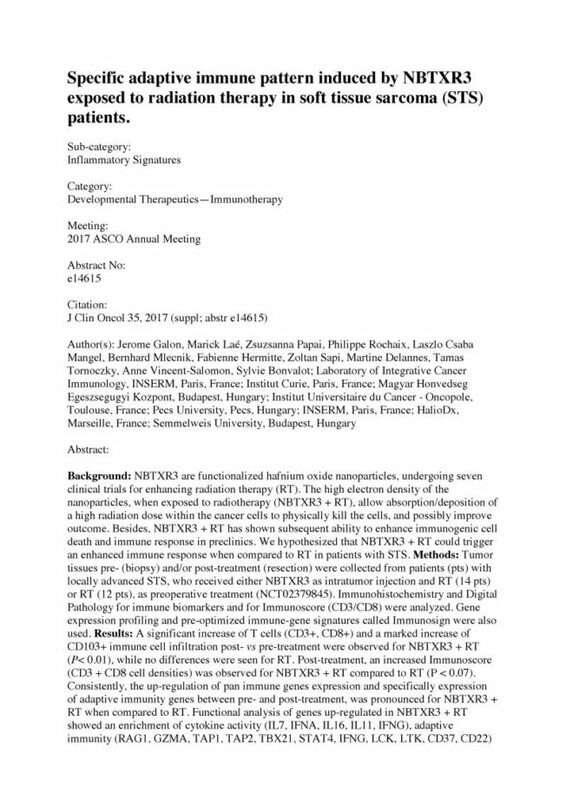 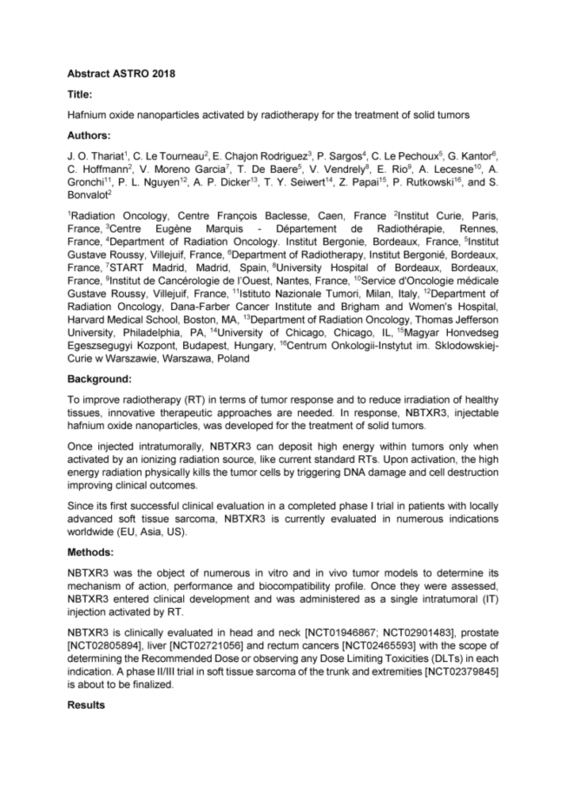 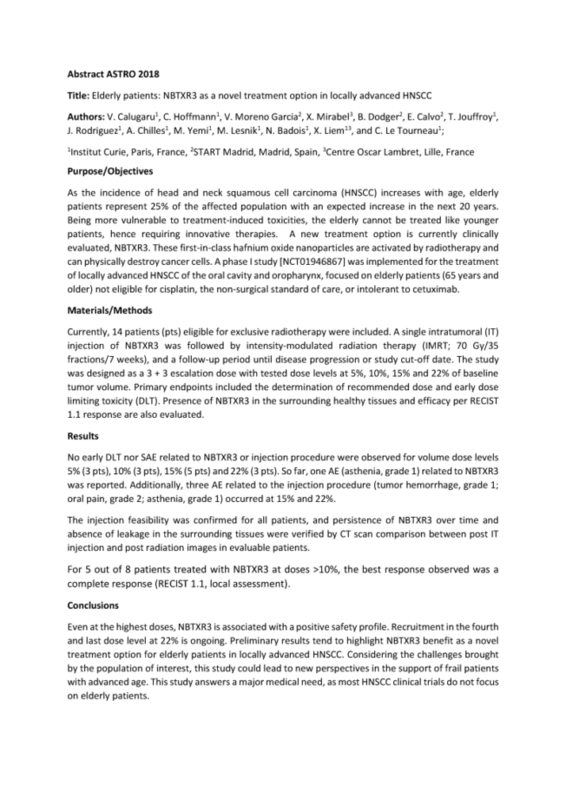 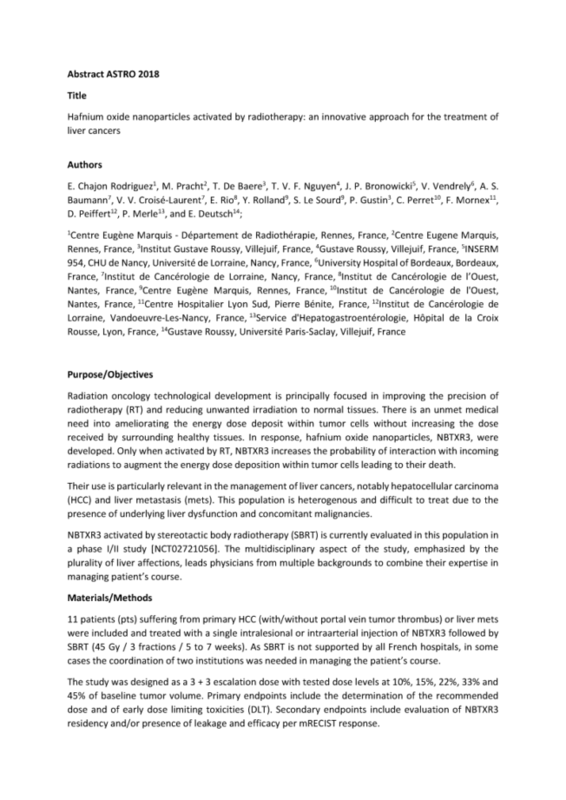 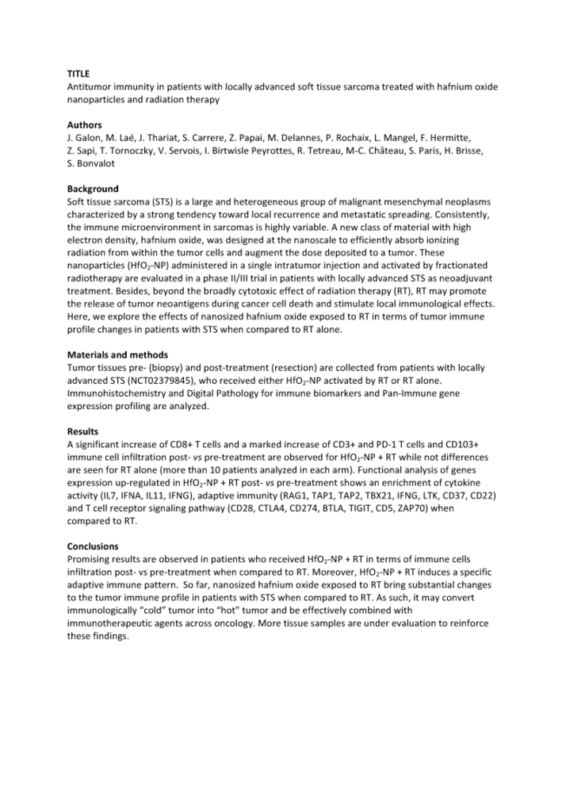 Publications in this section cover results of clinical trials with NBTXR3. 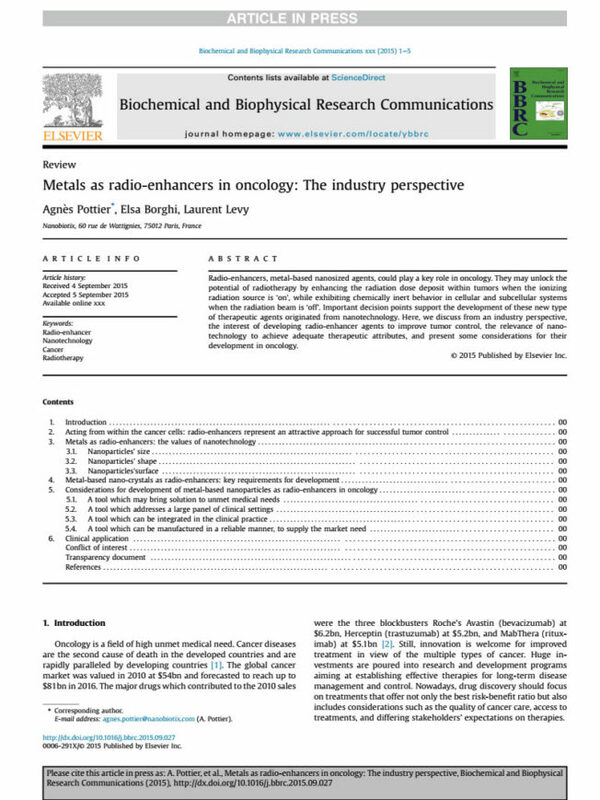 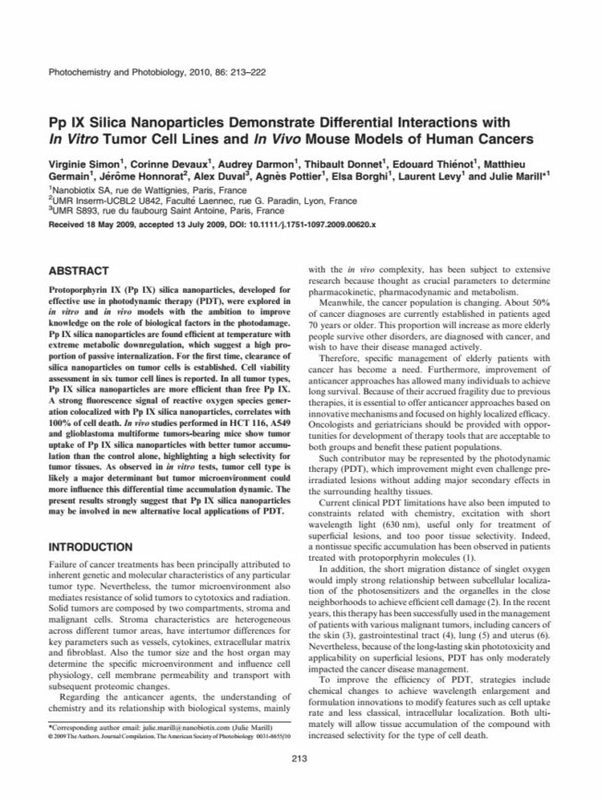 The reports are published in peer-reviewed journals. 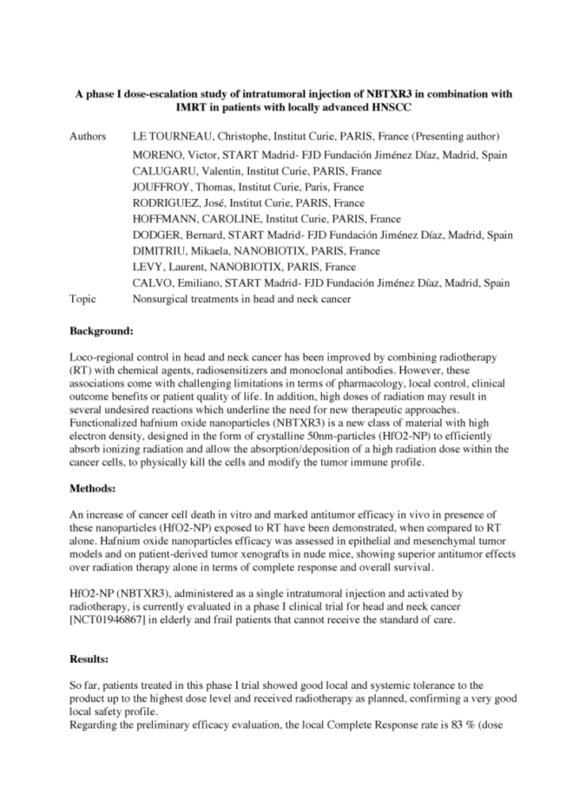 Peer-review means that the report has been reviewed by one or more experts with competence in the relevant field before it was accepted for publication by the journal. 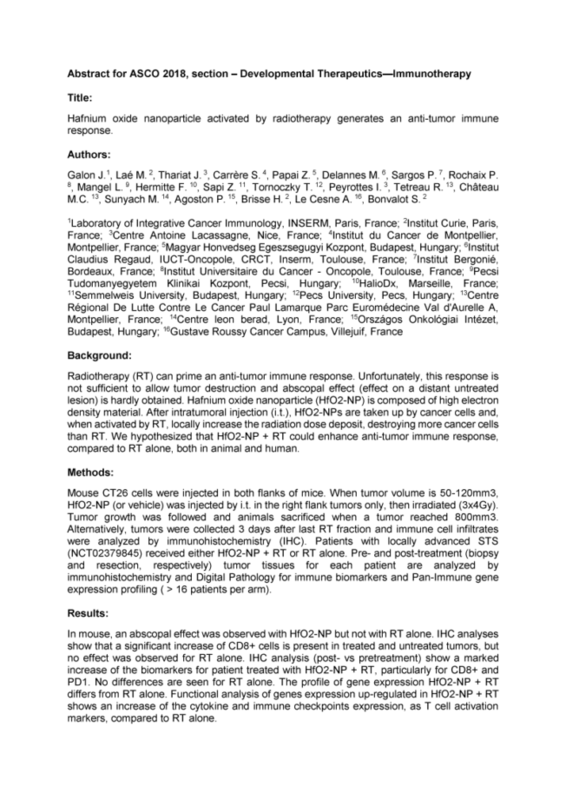 In vivo refers to tests of NBTXR3 in animals. 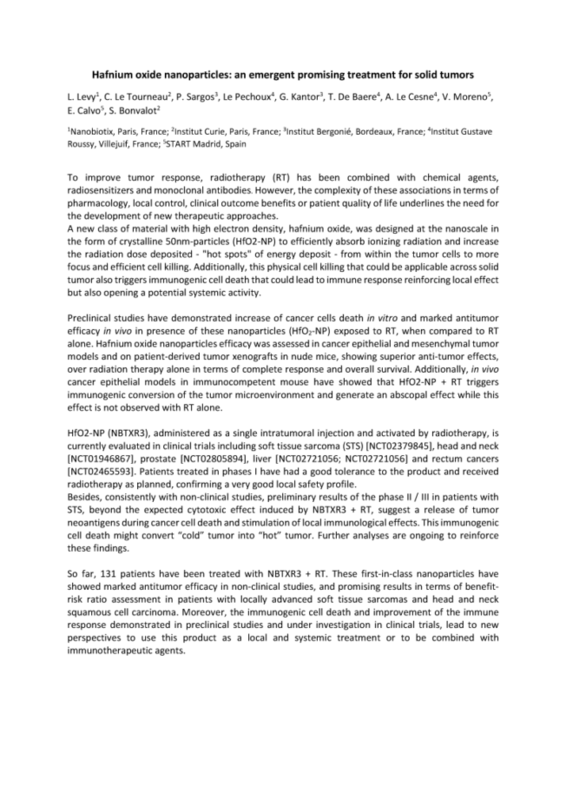 The reports are published in peer-reviewed journals (see explanation in clinical trials publications). 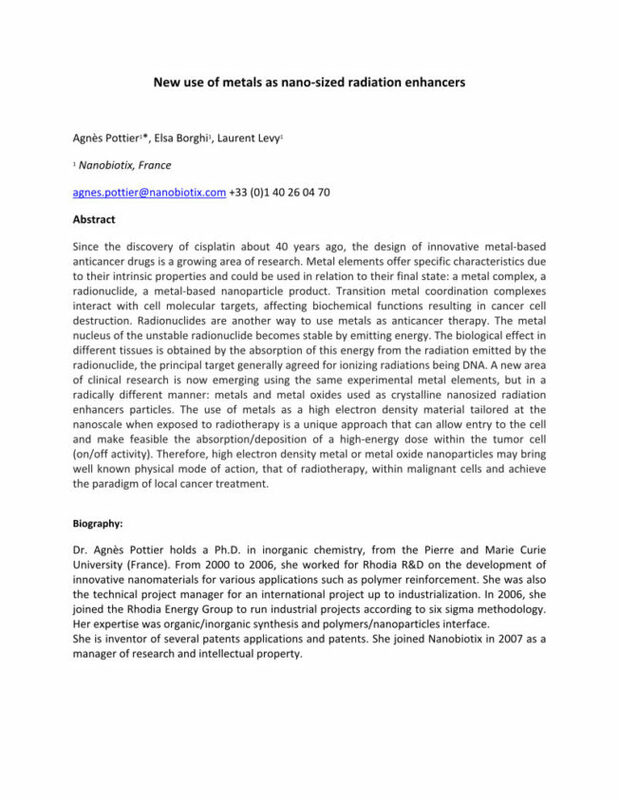 Reviews are publications covering a specific topic and authors are usually invited to write them. 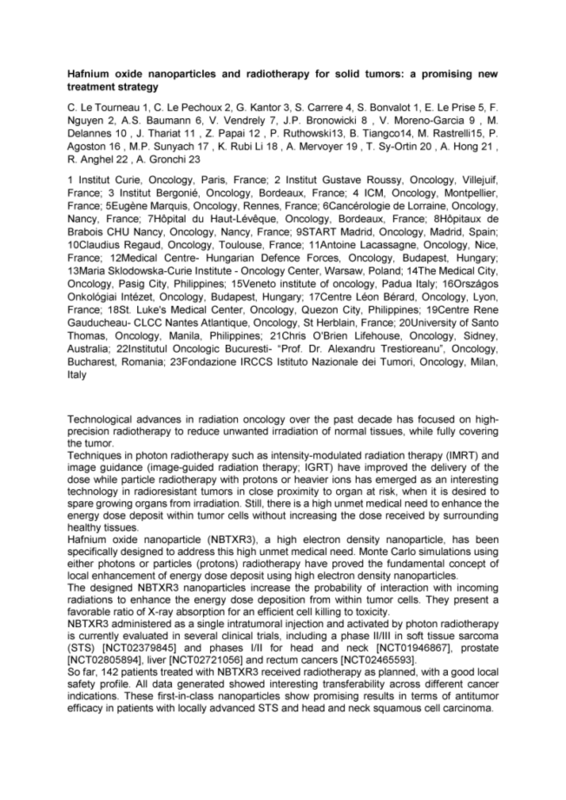 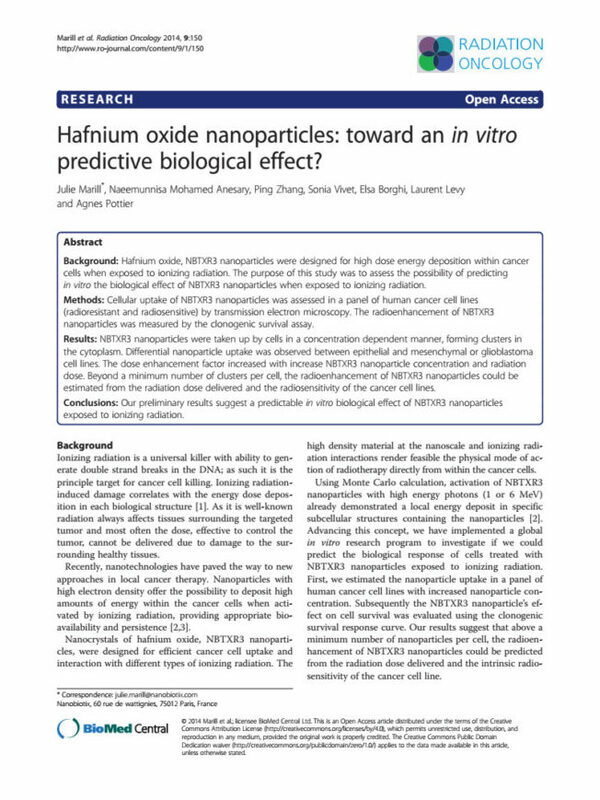 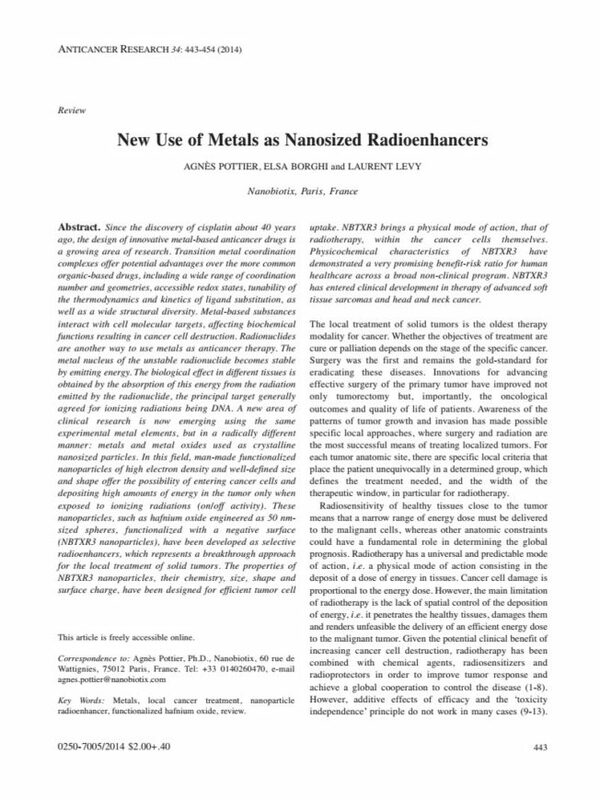 In this section publications of Nanobiotix can be found which are related to Nanobiotix’ other technologies or specific research projects. 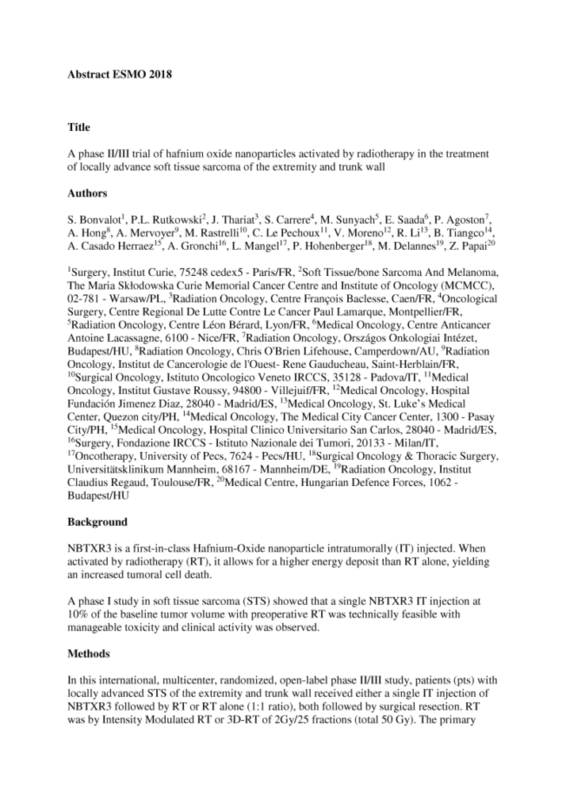 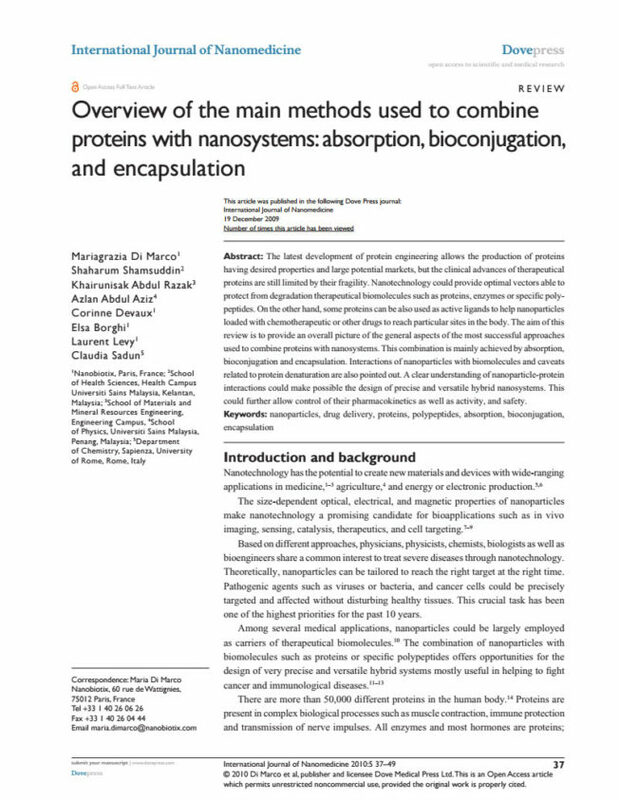 Congresses are a key element for Nanobiotix to publish scientific data and results. 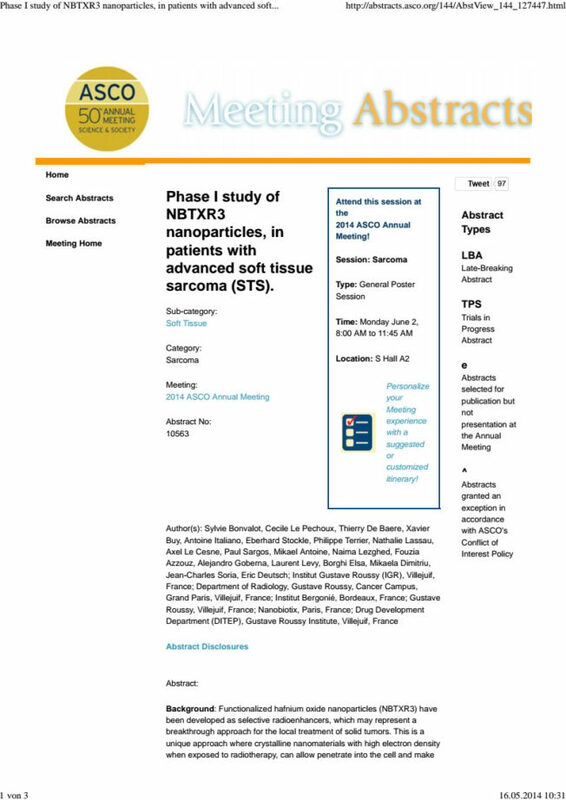 This section lists abstracts that have been published by Nanobiotix over the last decade. 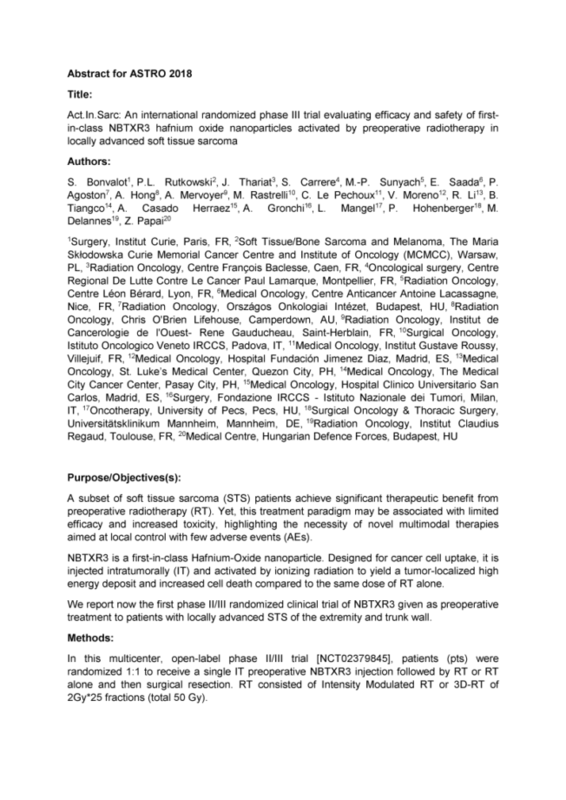 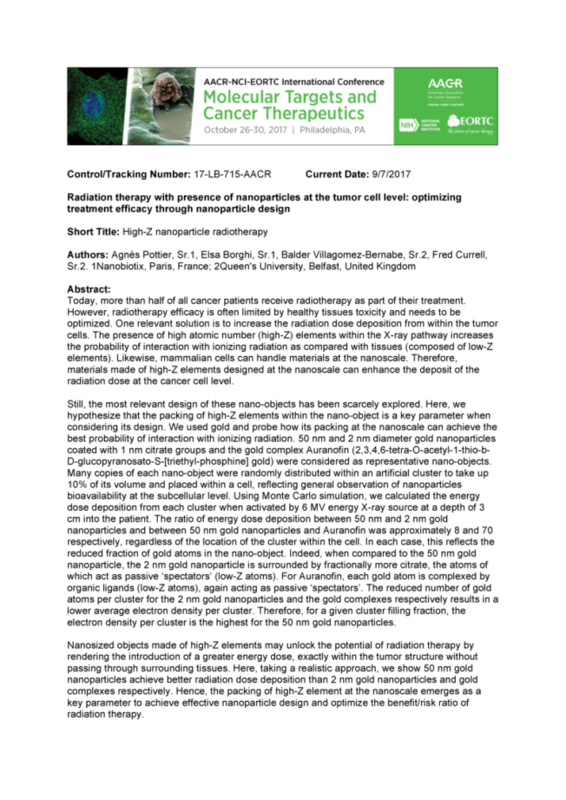 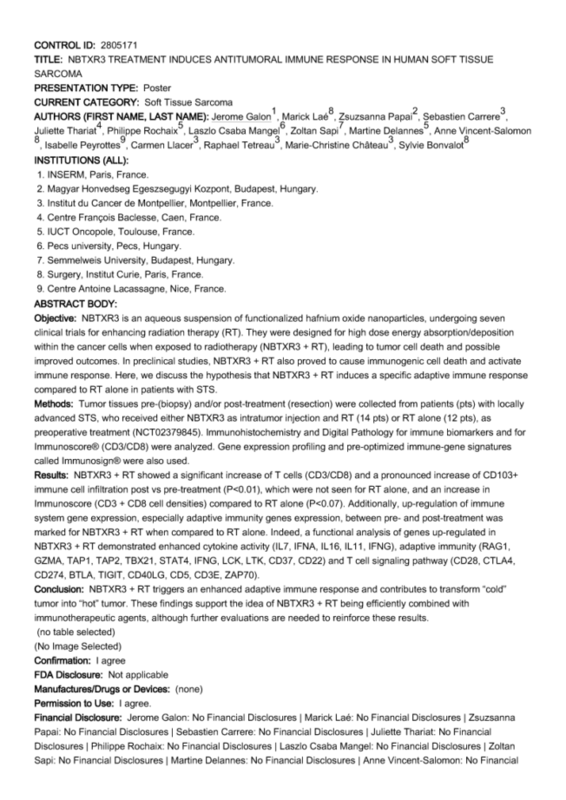 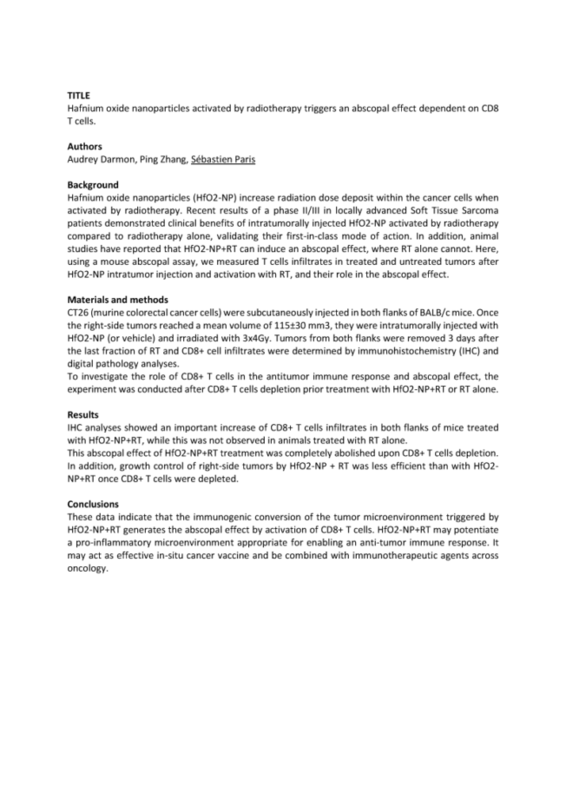 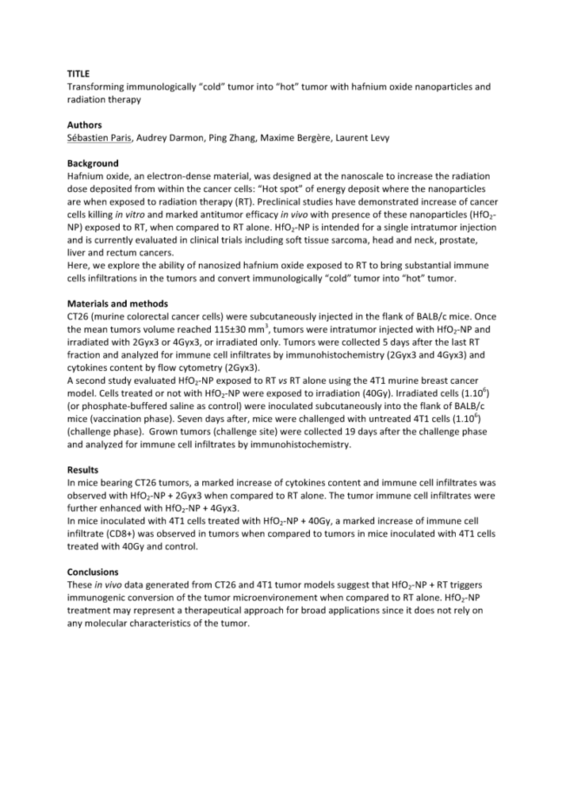 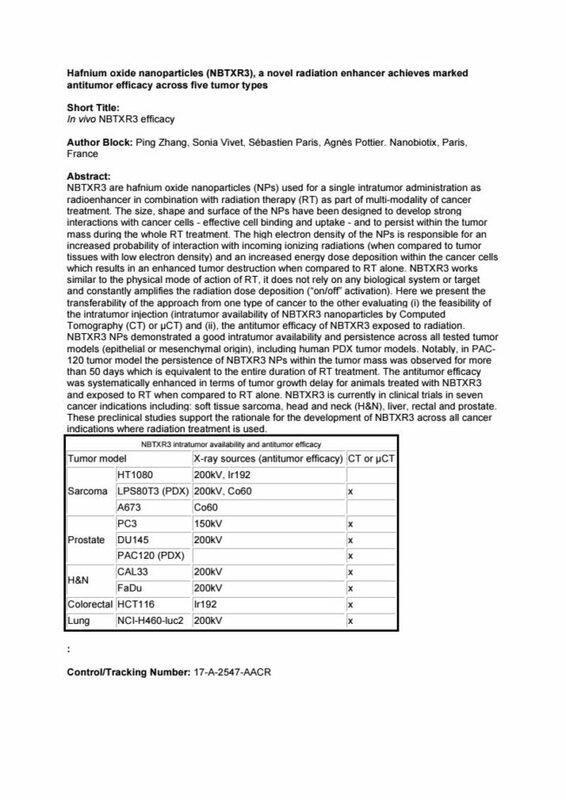 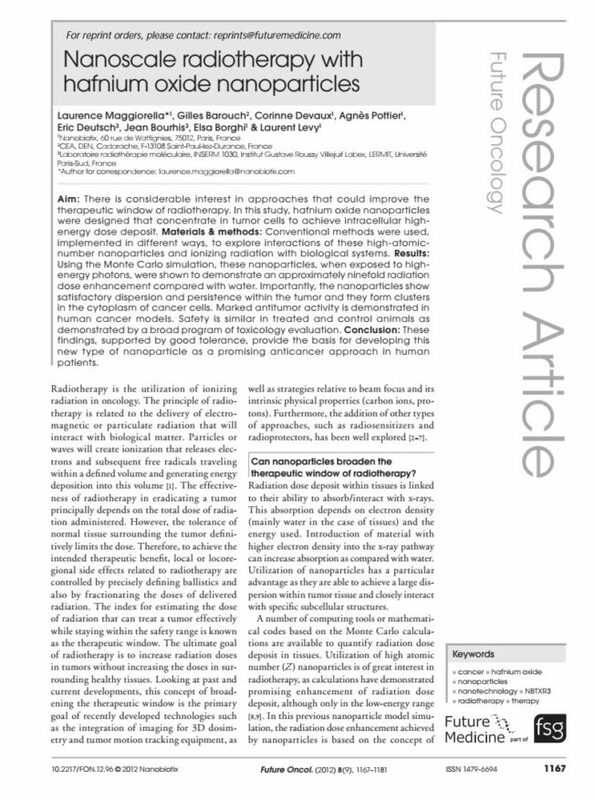 Abstracts in this section cover in vitro and in vivo data of NBTXR3. 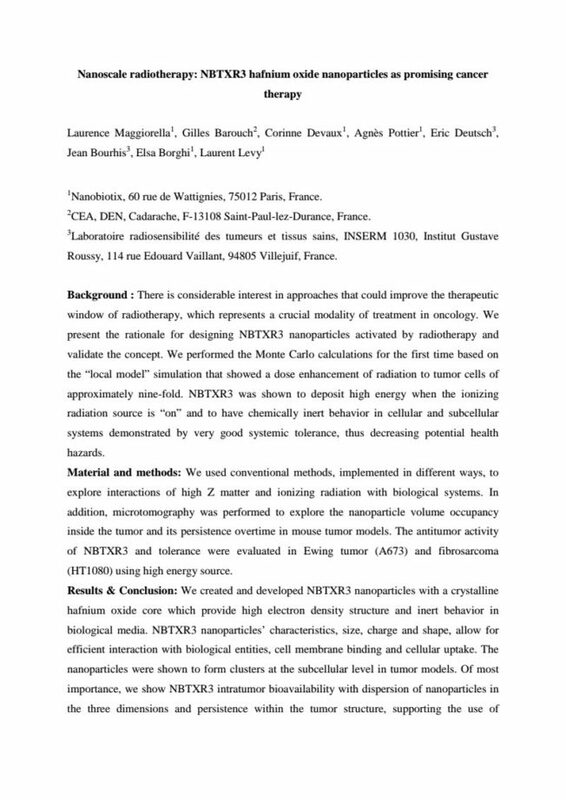 In vitro means that NBTXR3 was studied in cells outside their normal biological context. 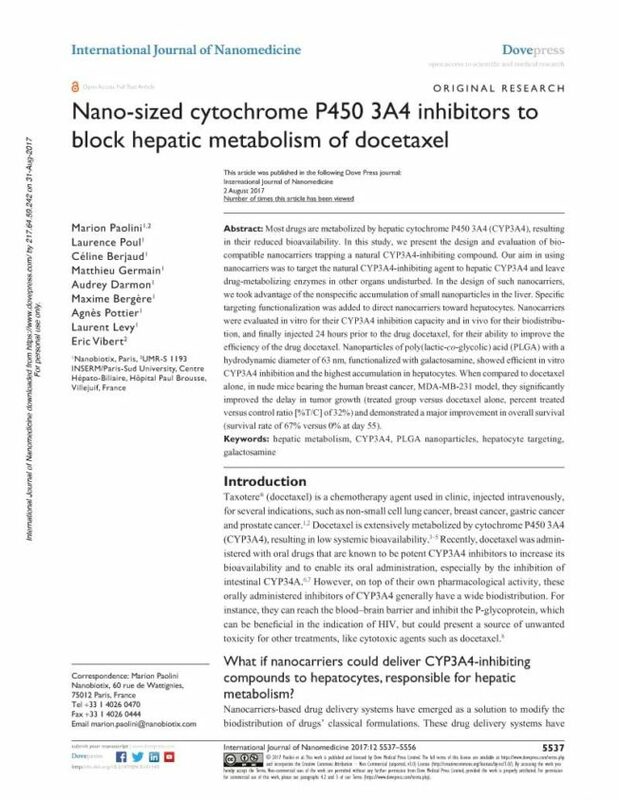 In vivo refers to tests of NBTXR3 in animals. 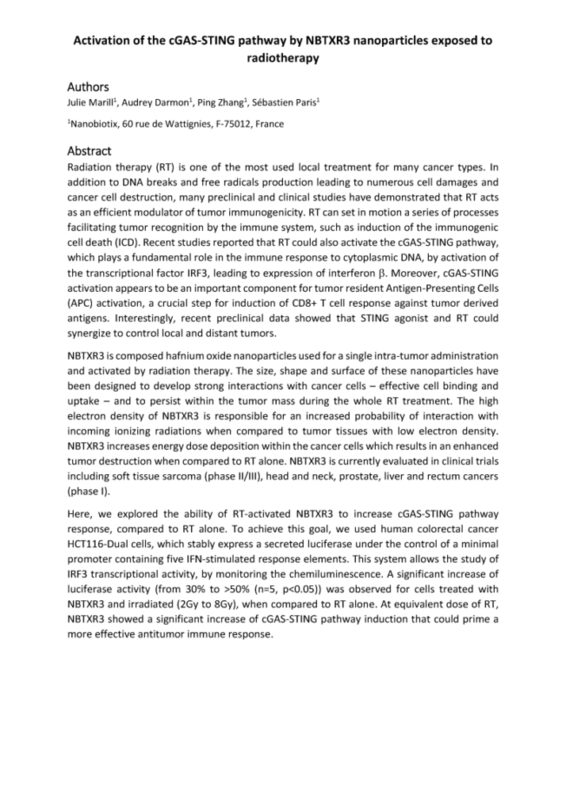 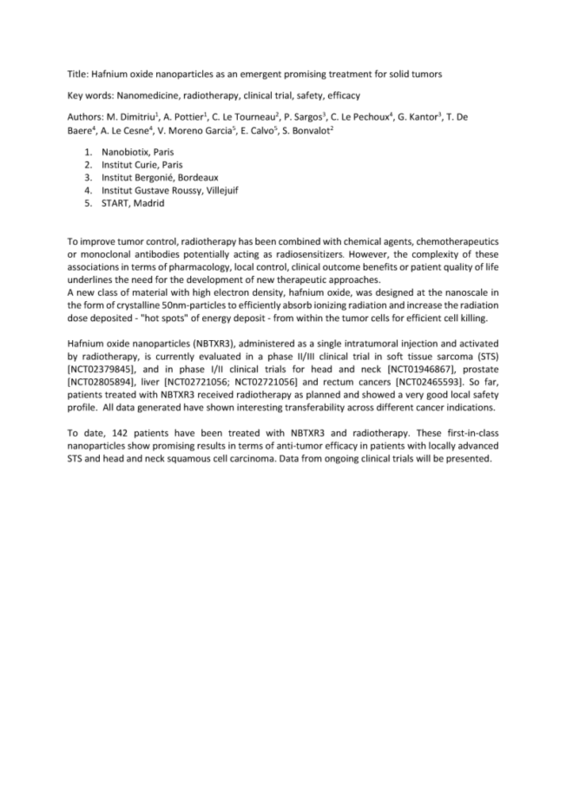 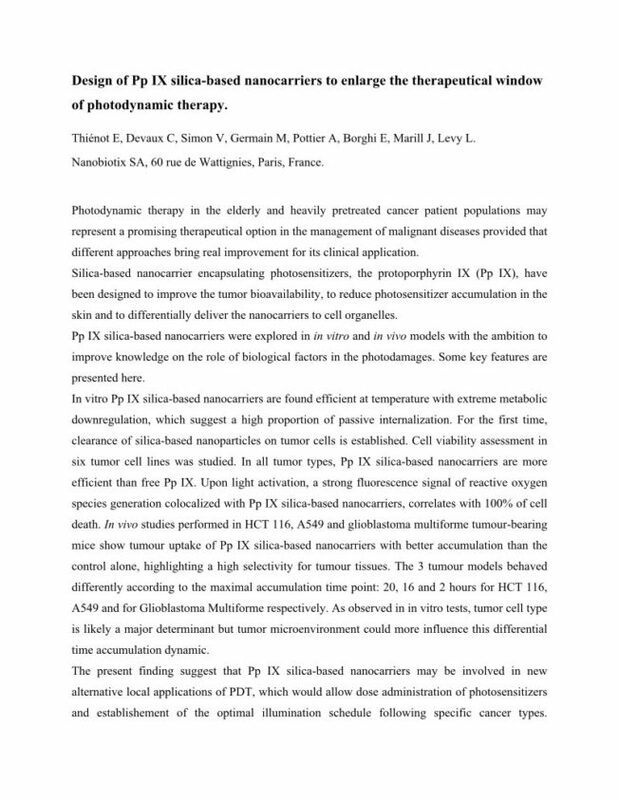 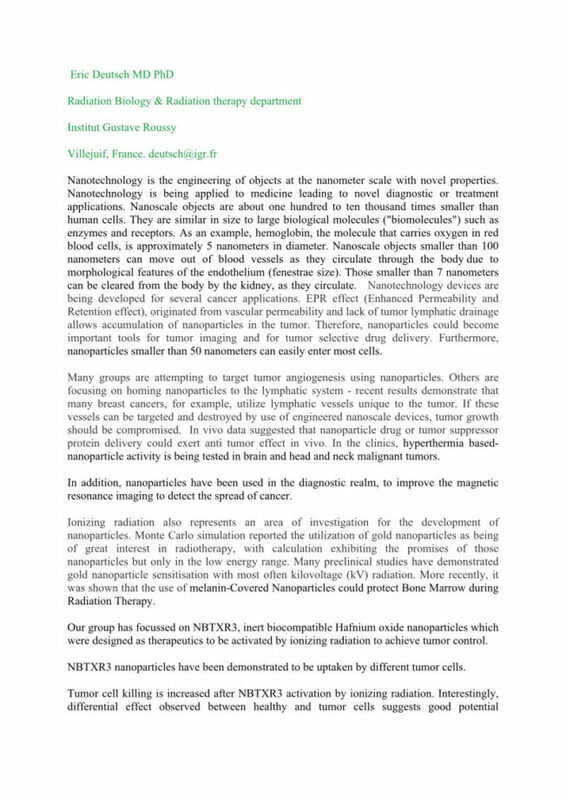 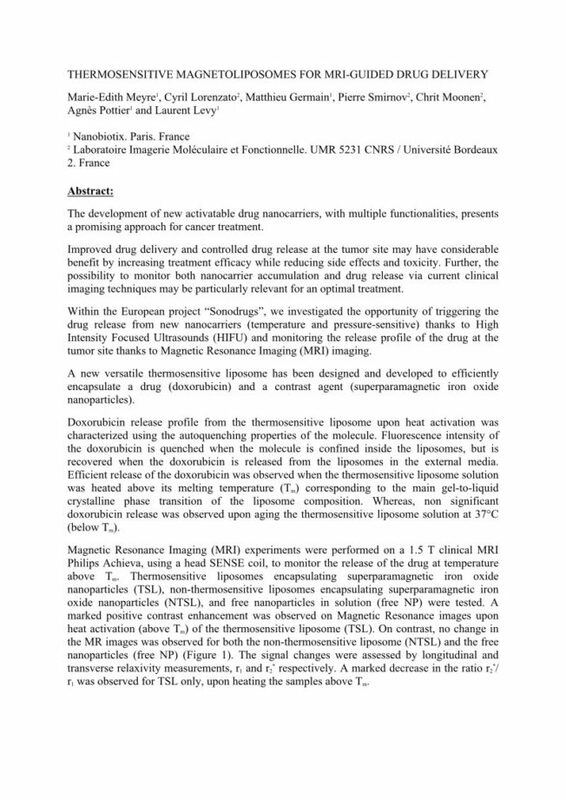 In this section abstracts of Nanobiotix can be found which are related to Nanobiotix other technologies or specific research projects. 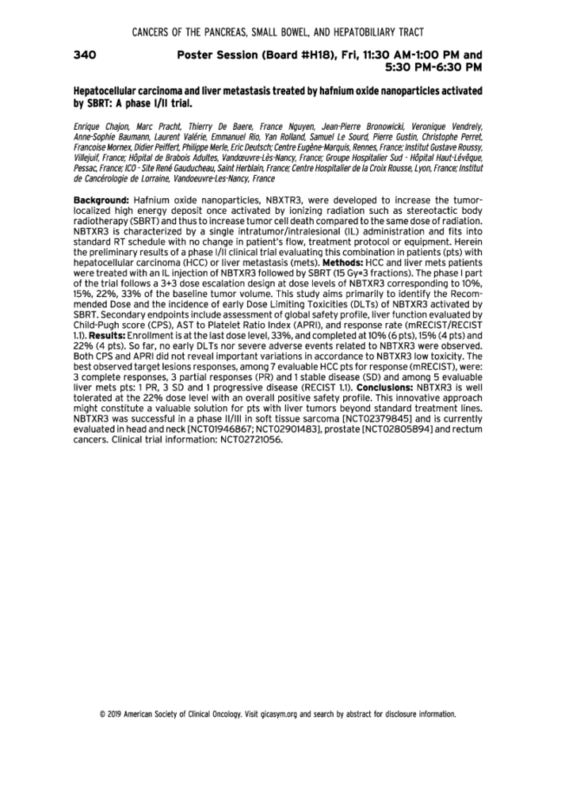 Don’t hesitate to contact our team. 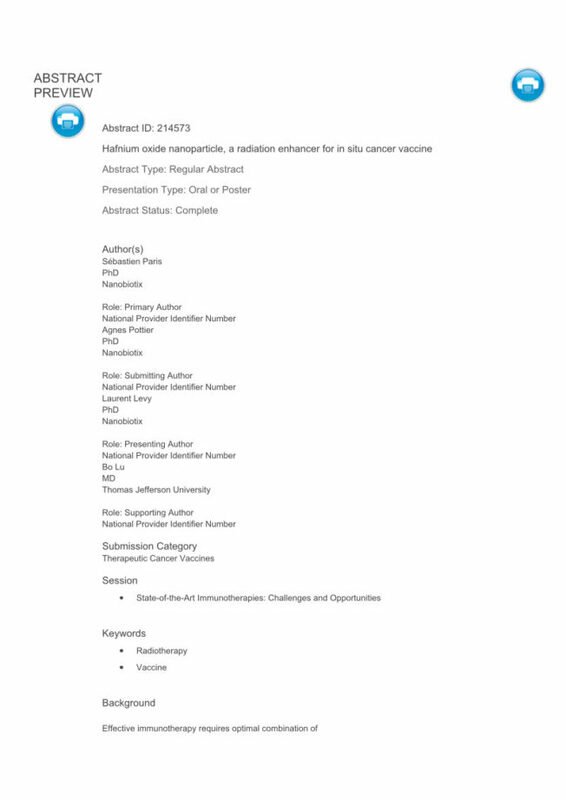 We are looking forward to guide you.